Cinnamon Coffee Cake Crisp! snack bars combine cinnamon and roasted hazelnuts with the flavors of vanilla coffee cake. 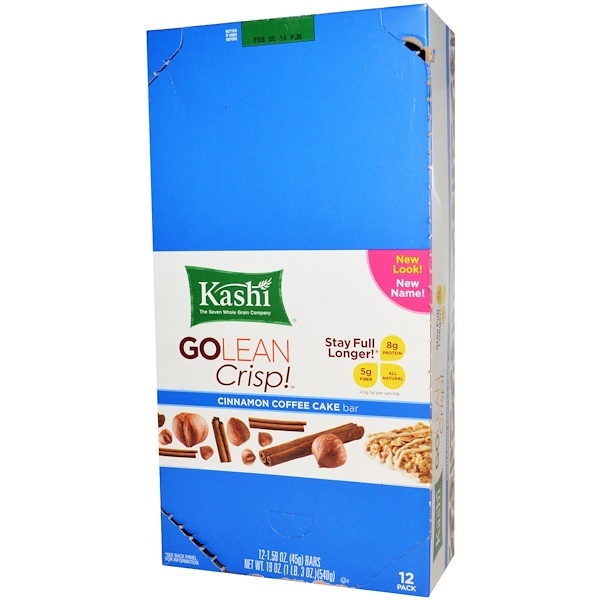 Just like Kashi GOLEAN bars with a unique blend of protein and fiber to help you stay satisfied and committed to eating right. 8 g Protein GOLEAN Crunchy! bars are a good source of protein. Protein helps give you a lasting feeling of satisfaction and is essential for muscle development. 5 g Fiber Fiber helps you feel full longer, keeps your digestive system running smoothly and helps balance blood sugar. All Natural No artificial colors, flavors or ingredients. Brown rice syrup, soy protein isolate, fructose, evaporated cane juice crystals, oat fiber, Kashi Seven Whole Grains & Sesame Blend (hard red wheat, oats, rye, barley, triticale, brown rice, buckwheat, sesame seeds), mechanically fractionated palm kernel oil, rice starch, hazelnuts, chicory root fiber, milled corn, honey, wheat bran, soy flour, vegetable glycerin, natural flavors, salt, corn bran, calcium carbonate, soy lecithin, cinnamon, magnesium oxide, vanilla extract, d-alpha tocopherol (vitamin E), ascorbic acid (vitamin C), mixed tocopherols for freshness, zinc oxide, ferrous fumarate, annatto (color), nonfat milk, pyridoxine hydrochloride (vitamin B6), folic acid, vitamin B12. 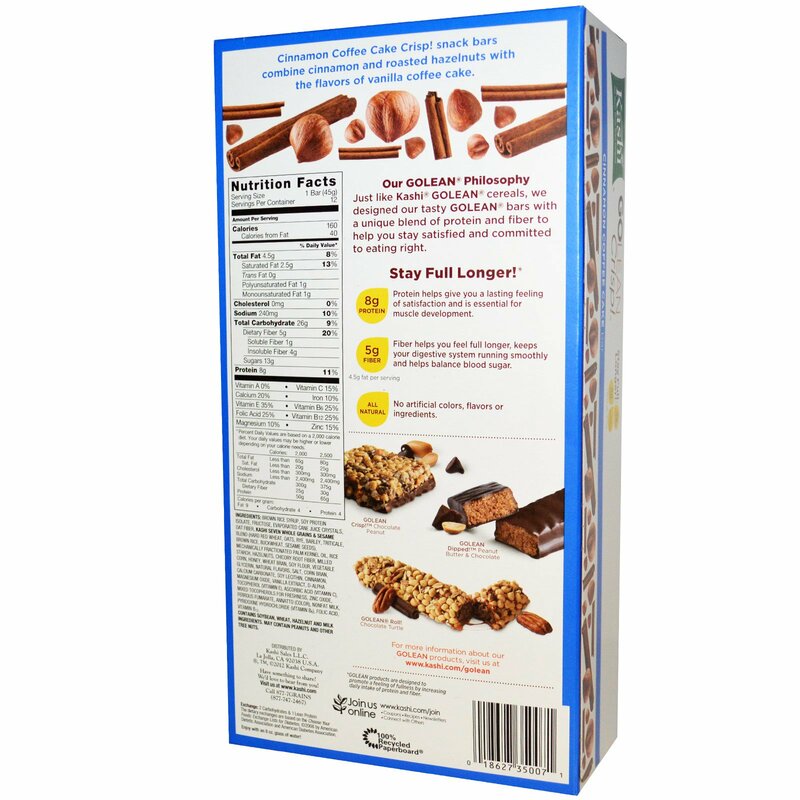 Contains soybean, wheat, hazelnut and milk ingredients. May contain peanuts and other tree nuts.